Smack-dab on the NSW-SA border, Australia’s first heritage-listed city Broken Hill is rich in history, art, culture and great food – but it’s also an amazing spot to base yourself for your off-the-beaten-track outback adventure! Here’s eight reasons to come say g’day to us at Broken Hill, the perfect gateway to the Outback. 1. Taste the true-blue Outback. Broken Hill is a unique town where modernity and history meet in amazing ways – but no Outback adventure is complete without going seriously out-of-town and back-of-Bourke. Broken Hill often gets called the Capital of the Outback, and for good reason: from quaint little heritage towns with only a dozen or so residents, to rugged empty frontier landscapes that have inspired artists for generations, you’ll find there’s so much to explore when you leave the city and hit the road. 2. Our rock art rocks. Dad-jokes aside, Broken Hill has been inhabited for tens of thousands of years, with a legacy of some truly extraordinary rock art. Our sister company, Tri State Tours, has exclusive access to a privately-owned station just north of Broken Hill, where you’ll be one of the rare and privileged few to ever experience its artworks including fascinating indigenous Panaramitee rock engravings, and over 18 thousand recorded motifs. These tours are a fascinating piece of indigenous Australian artistic history, and they certainly take our breath away! There’s a lot more to our beautiful country than its famous beaches and cityscapes, but for many residents and visitors to Australia alike, the only time you’ll get to see its diverse fauna are at zoos, or its flora at the side of busy roads. People often think of regional and remote Australia as dry and desolate, but it’s actually so colourful and alive, and we love sharing the beauty of Broken Hill and surrounds with new people. From wildflower-spotting in Spring, to stunning sunsets over ochre-red sands, and the extraordinary diversity of birdlife at spots like the wetlands of nearby Menindee Lakes, you’ll find yourself awestruck by how beautiful our little corner of the globe is. Traversing this great southern land is high on many bucket lists, and for good reason: scenery like you’ve seen nowhere else, and itty-bitty towns full of charm, character and friendly locals. Broken Hill is more than just a pit stop before you reach the Nullarbor – it’s been awarded the honour of being Australia’s first heritage-listed city for good reason! – but if you’re planning to make that must-do trip, make sure you make leeway for a week or two to enjoy everything we have to offer. As well as being right on the NSW-SA border, we’re also only a seven hour drive from the QLD border, so whether you’re heading east-west or north-south, we’re so much more than an accessible rest stop: we’re an iconic destination, where you’ll make memories to last forever. 5. Deep roots and great yarns. at the Palace Hotel, you’ll experience a feeling of community spirit that for all its intangibility is perhaps the most valuable attraction of all. 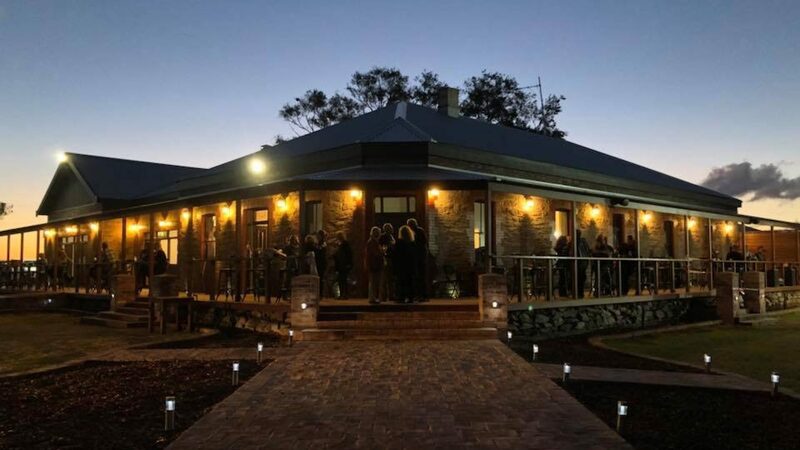 While you’re on the hunt for history-rich yarning spots, don’t miss the Mt Gipps Hotel, located on our resort – a well-known landmark for adventurers and beloved community institution, this home of many a yarn closed back in 1987 and is now restored to its former glory, open seven days a week for live music, tasty country pub food, a tipple or two, and making new friends. 6. Something for everyone, at every budget. We’re particularly proud to be running an outback resort that’s truly one of its kind, both in the Broken Hill area and throughout Australia. From gorgeous hotel rooms to unpowered campsites, holidaymakers can have the freedom to travel their way when they stay with us, with all the modern amenities you can expect from a $5-million resort so that even when you’re roughing it, you don’t have to make it too rough! We love a bit of cheer and banter, and it’s hard to beat festivals for the spirit of outback community fun! Broken Hill has some amazing festivals, from the fascinating Heritage Festival, the iconic annual short film festival The Perfect Light Film Festival, and the colourful drag queen extravaganza Broken Heel Festival. 8. Be inspired by regional and remote Aussie art. Broken Hill and surrounds have played an important role in regional and remote Australian art for generations, and even boasts the oldest regional art gallery in NSW with unmissable exhibitions of old and new art in diverse styles. Despite Broken Hill’s well-deserved reputation for its excellent country pubs, there’s actually even more galleries in town – 20 in total! Some famous Aussie artists who have been inspired by this jewel of the outback include the Brushmen of the Bush – Jack Absalom, Pro Hart, Hugh Schulz, John Pickup and Eric Minchin – as well as Pro Hart’s very talented daughter, Julie Hart. There’s plenty of art to be seen outside of the galleries, as well: from vibrant street art to the sculptures of the Living Desert Reserve, Broken Hill lives and breathes creativity. So make sure that you put Broken Hill high up on your Aussie driveabout bucket list – with gorgeous architecture, rich history, friendly locals and the Outback at your doorstep, it’s an unmissable treat for those with adventurous hearts and curious minds.